It was soon after the iPad 2 announcement that the trouble started brewing. Neat, I thought – I’d take a Bondi Blue one any day. So Thomas made one. And then another. And then more. We had so much fun watching all of Thomas’s retro iPads come through that, shucks, why not make a retro Apple.com page again? 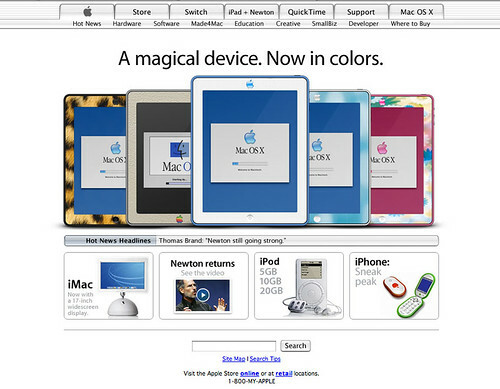 So there you have it: Apple.com, circa never. This time, I used the OS X 10.2 Jaguar-era Apple.com, with a fun iPhone fake mockup and an announcement that will never, ever come. As far as the iPad goes: the white iPad 2 is the first time I’ve actually considered wanting an iPad. I still don’t have an iPad-shaped hole in my life, and the $499 could be used more productively in a lot of other places, but who knows. It’s a wonderful-looking product, and put me down as a fan of the white versions of Apple’s mobile devices. Another side note: Thomas has been on fire over at Egg Freckles. Not only is his the best-looking blog on the web, but he’s cranking out great stuff lately. Posted by davelawrence8 at 5:52 am on March 7th, 2011. No comments... » Categories: apple, design, ipad, lowend. Tags: apple.com, ipad 2, messagepad, newton, retro, thomas brand. Subscribe via RSS.